Jesus said to his disciples: Freely you have received, freely give. What they have received from Jesus they must now pass on to others without expecting a kindness in return, whether it is in form of a gift or payment. They must show by their approach that their first interest is in serving God, not receiving material gain. They must serve without craftiness, full of charity and peace, and simplicity. They must give their full attention to the proclamation of God’s kingdom and not be unfocused by other lesser things. They must travel light only take what was necessary and leave behind whatever would divert them in order to think on the task of speaking the word of the God. They must do their work, not for what they can get out of it, but for what they can give freely to others, without expecting special privileges or reward. “Poverty of spirit” frees us from greed and worry with possessions and makes ample room for God’s provision. The Lord wants his disciples to be reliant on him and not on them. Also, Jesus said: the worker deserves his nourishment. Here we see a double truth: the worker of God must not be overly concerned with material things, but the people of God must never fail in their duty to give the worker of God what he or she needs to sustain them in the Lord's service. Do we pray for the work of the gospel and do we support it with your material and monetary resources? 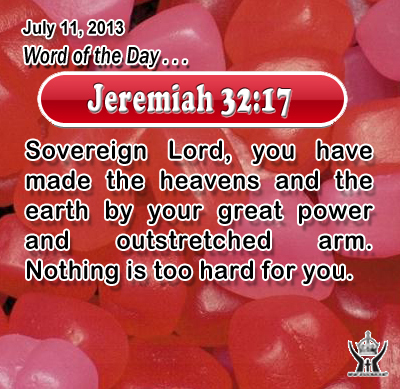 Jeremiah 32:17 Sovereign Lord, you have made the heavens and the earth by your great power and outstretched arm. Nothing is too hard for you. O Great God of the heavens, thank you for caring for us when we are such a small part of your great work in the universe. Your love is beyond our comprehension and yet it thrills us to know that in your grace one day we will see you face to face. In Infant Jesus' name we praise you. Amen. 7And preach as you go, saying, `The kingdom of heaven is at hand.' 8 Heal the sick, raise the dead, cleanse lepers, cast out demons. You received without paying, give without pay. 9 Take no gold, nor silver, nor copper in your belts, 10 no bag for your journey, nor two tunics, nor sandals, nor a staff; for the laborer deserves his food. 11 And whatever town or village you enter, find out who is worthy in it, and stay with him until you depart. 12 As you enter the house, salute it. 13 And if the house is worthy, let your peace come upon it; but if it is not worthy, let your peace return to you. 14 And if any one will not receive you or listen to your words, shake off the dust from your feet as you leave that house or town. 15 Truly, I say to you, it shall be more tolerable on the day of judgment for the land of Sodom and Gomor'rah than for that town.